I've always been a fan of pallet signs, but have never taken the time to rip a pallet apart (or convince the hubby to get one for me). I really wanted to add some decor to my new craft room, and with a little help from FloraCraft® Make It: Fun® Foam Sheets, I was able to create this faux pallet sign with just two foam sheets and a few other materials I had on hand! Using foam is a much cheaper option in the long run. Plus, the sign weighs almost nothing at all, which means no large holes in the wall!! 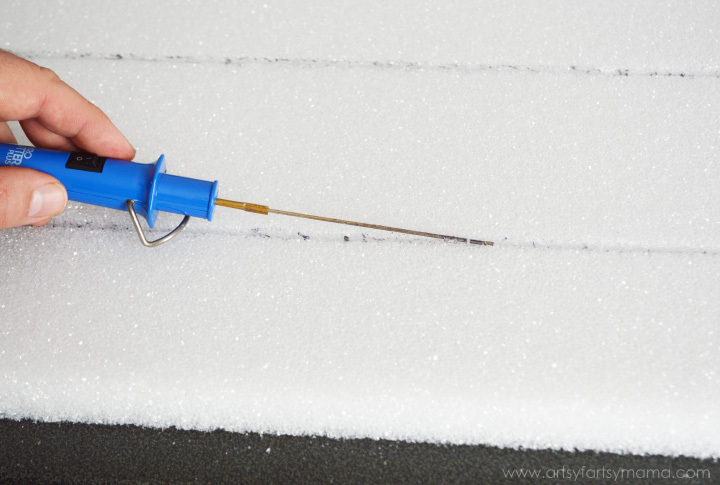 Using a large ruler or yardstick, mark two horizontal lines on the 15/16" thick foam sheet. I marked mine about 4 inches apart. 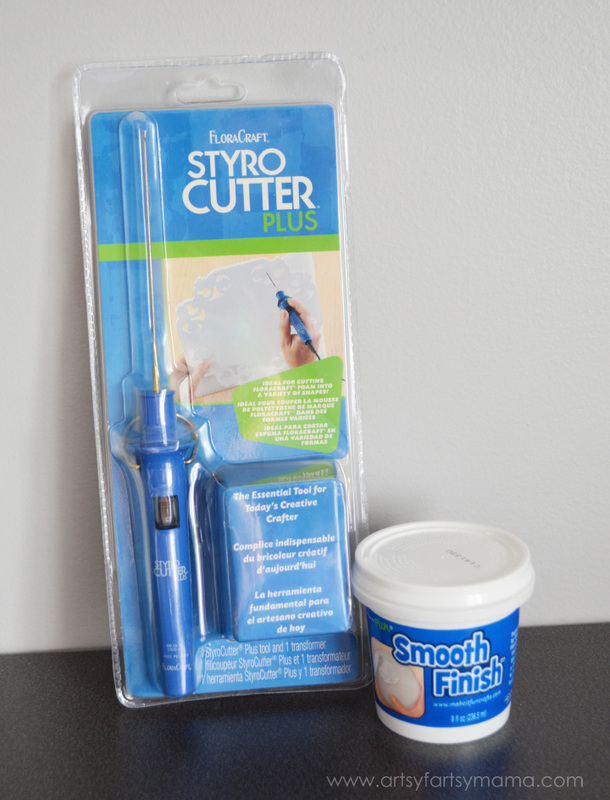 I highly recommend the StyroCutter Plus if you'll be crafting with foam!! It heats up in less than 30 second, and cuts through foam like butter with little effort. Lightly run the StyroCutter Plus along the lines and cut down into the sheet about 1/4 of the way. This will make your foam sheet look like it's pallets, so don't stress about making the lines perfect! Using a spatula or putty knife (something you won't be using on food again), open a Smooth Finish container and stir it up. It should be like a frosting consistency. If it seems a little dry, you can add a drop or two of water. 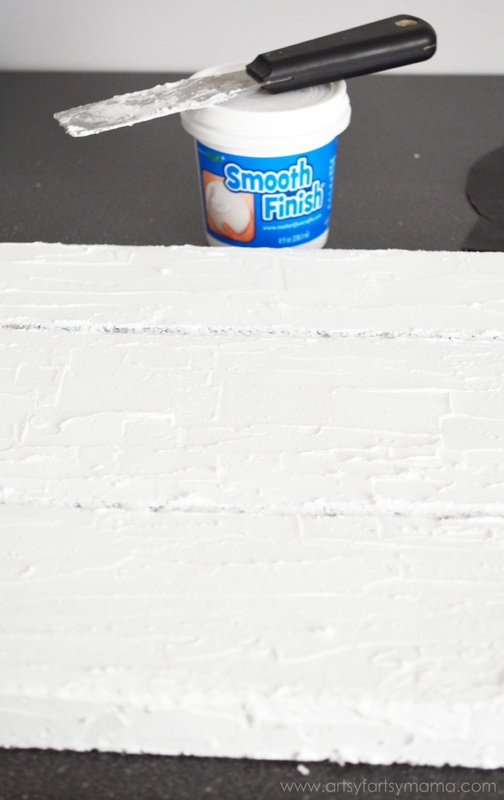 Spread the Smooth Finish onto the foam sheet, one section at a time, then cover the edges. Try to get it on smooth, but add a little texture like you'd see in wood. You can also cover the cut lines, but then carve them back out with the putty knife or a plastic knife. You don't want to fill them in completely! Let the foam sheet dry overnight. Print out some letters, and then cut them out. Trace them onto the 7/8" thick foam sheet. If you have straight edges on letters, feel free to line them up with the edge of the sheet! One less cut you'll have to make. Using the StyroCutter Plus, cut out the letters. Follow the traced lines and be sure to go SLOW and let the tool do the work. For the inside of letters like "A" and "R", you can simply stab the StyroCutter Plus into the foam and it cuts right through with no problem at all!! I wanted a different kind of texture on the letters than using Smooth Finish, so I decided to simply decoupage the foam. All you need is some Mod Podge and tissue paper cut into small pieces. 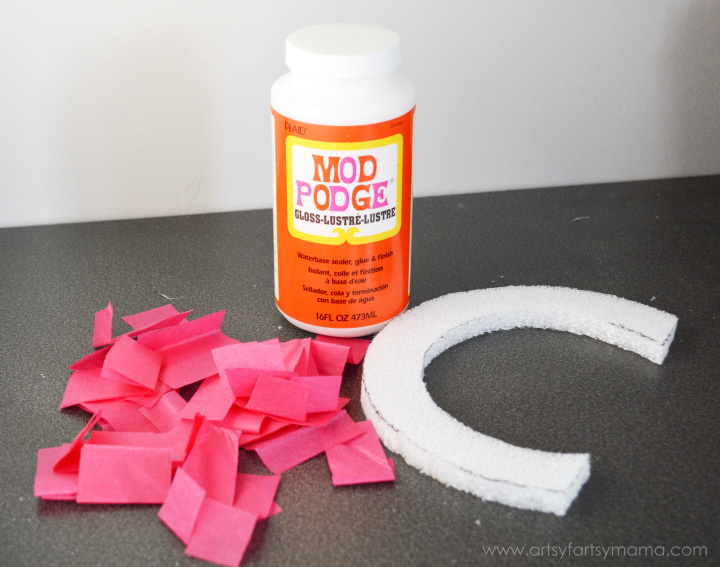 Paint some Mod Podge onto the letter and add a piece of tissue paper. 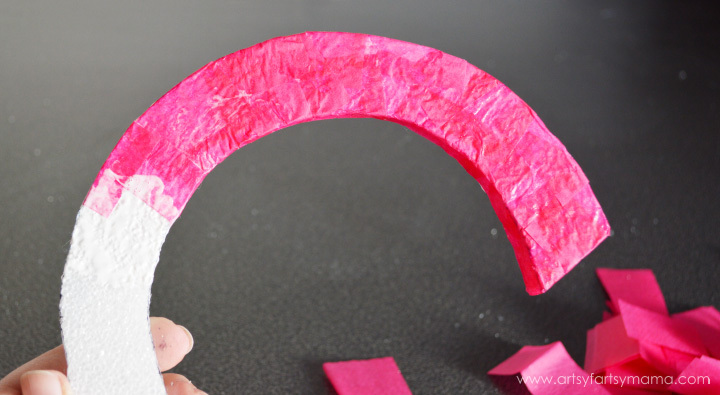 Keep painting Mod Podge and overlapping tissue paper pieces until the letter is covered. I love how the letter has different shades of pink from all the layers!! 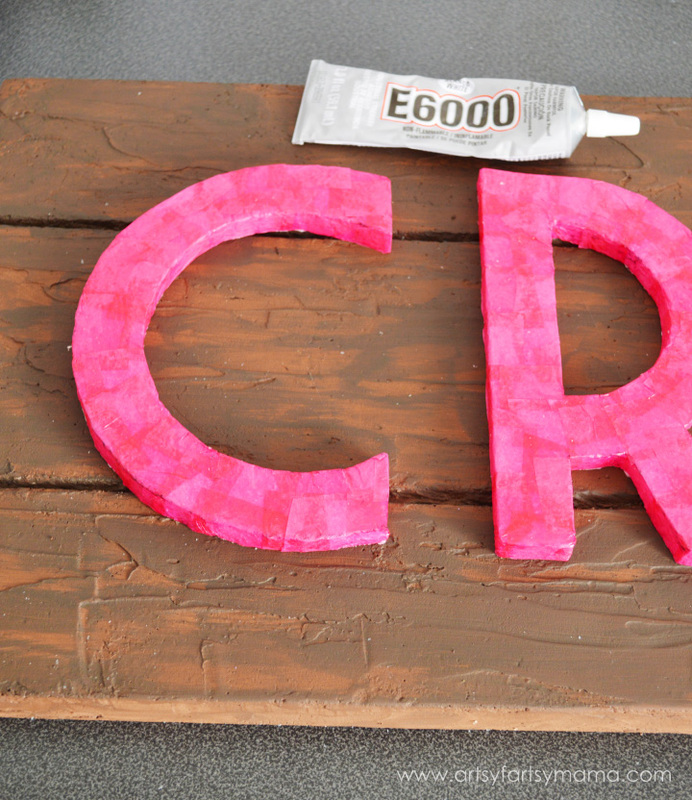 Once it's dry, you can paint a thin layer of Mod Podge on top of the letter. Once the board is completely dry (if you let it sit overnight, it will be fine), lightly sand the board to get it smooth. 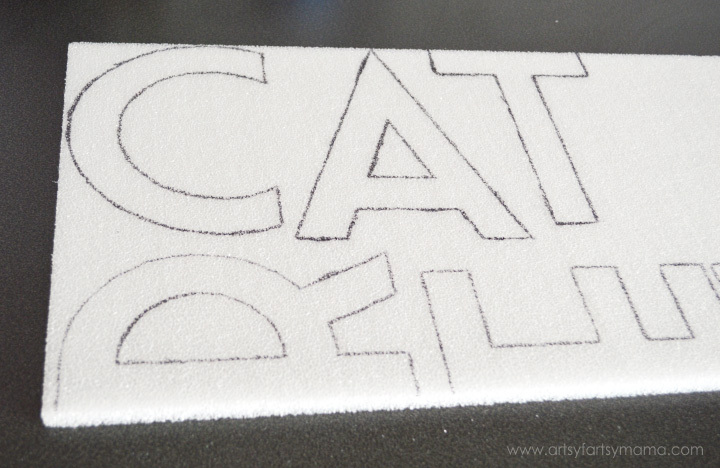 You'll still see the texture, but it will be smooth so you easily paint it and so can attach the letters easier. Paint the board in a brown color (mine was a chocolate brown). I only needed one coat and it covered great! You can leave the board as-is, but I added a little bit of a darker brown on top to give it a little dimension and make it look a little more like wood. You just need to paint a light coat, and it can be blotchy! You want to be able to see some of the chocolate brown color showing through. 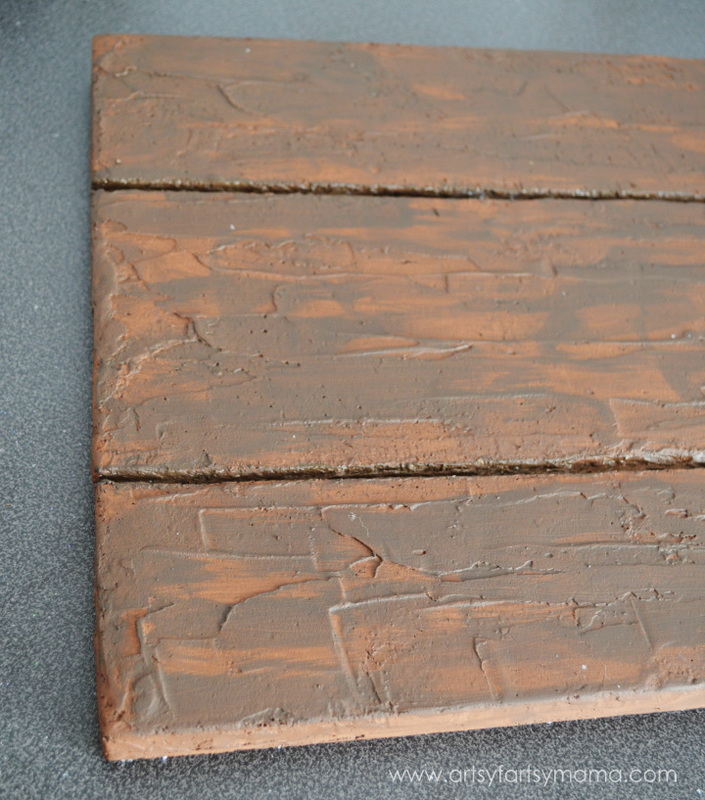 I also painted the cut lines in the darker brown with a small paint brush. Let the paint dry, then lay the letters on the board to get an idea of where you want them to go. Then, attach the letters with some E6000 or hot glue. Use a ruler or measuring tape to make sure your letters are on evenly. Since the sign is made of foam instead of pallet boards, it's incredibly light! You can hang it with 3M Command Strips with no problem at all, or make a hanger on the back with some string and hang the sign on a nail. WOW, this sign turned out beautifully! You've definitely inspired me today! So creative! I would have never thought that a foam sheet could be used to make a sign like this! I LOVE everything about this, and I definitely thought it was made from a real pallet when I first saw it! This is amazing - I can't believe you "fauxed" the pallet art. How awesome! Beautiful! I love the pop of pink, too. Thank you! I have been wanting one of those styrofoam cutters for a while now. They look cool! This is an awesome alternative!! Super cute! It came out awesome! What?! That's FOAM?! I would never have known! Very cute and it looks so easy! This is so cute! I have a pallet sign in my office (which I love, don't get me wrong) but it's soooo heavy! This is genius being so light! Add some glitter and I'm sold :) Love it!